Is the “Women and Children First” Norm a Myth? Women have a distinct survival disadvantage compared to men. 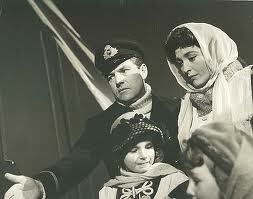 Captains and crew survive at a significantly higher rate than passengers. We also find that the captain has the power to enforce normative behavior, that the gender gap in survival rates has declined, that women have a larger disadvantage in British shipwrecks, and that there seems to be no association between duration of a disaster and the impact of social norms. The Global Post reports, thus, that “the women and children rule is a myth.” If valid, this finding would be interesting on a number of levels, not least because perceptions that this norm exists are so strong many people were surprised to learn it it not actually inscribed in maritime law after the sinking of the Costa Concordia in January. It would also correspond with data from air disasters, which shows that being male drastically increases one’s likelihood of survival. However, there are problems with this interpretation. One is that the sample is non-random and suffers from missing data. This is beyond the authors’ control of course, but eighteen cases is too few to conduct a meaningful regression analysis… particularly with a non-random sample and particularly if you are attempting to generalize to a wider set of cases. A research method designed for medium-N cases (like fuzzy-set QCA) is probably more appropriate. The descriptive statistics themselves are certainly interesting. But I’m also concerned about the coding: it seems that particularly in investigating the role of captains in enforcing a “WCF” rule (as opposed to the rule having an internalized influence over male crew-members and passengers), the authors would have needed to distinguish between wrecks where the order was given and enforced (eg the Titanic), versus where it was given but not enforced (the SS Arctic) as opposed to the many wrecks where it was apparently not given at all. Yet it appears that a ship gets the “WCF” code in either case, which is why the Arctic is considered one of the five exemplary wrecks even though not a single woman or child survived… meanwhile presumably if there were any cases of internalized normative conduct in evacuations not mandated by the captain (that is, where the norm had become internalized so that the crew followed it automatically without an order), it would not be reflected in the coding. So while the evidence of the gender gap in survival rates is clear and striking, I think it’s hard to actually determine whether and how norm-based behavior affected this, other than to say that in the presence of a norm we would have expected to see more women and children to survive. In sum, the “myth” documented here is not that such a norm “exists” but rather that it has the effect we have been taught to think it does. Another good reason not to make generalized arguments on the basis of single case studies: they may turn out to be outliers. 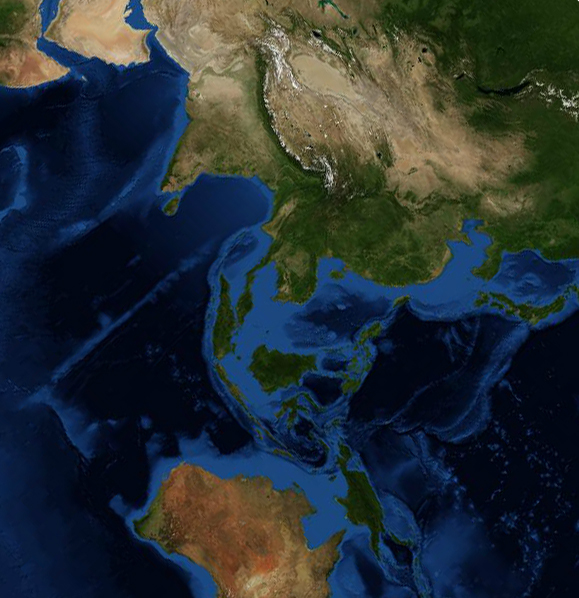 The term “Indo-Pacific” has been used since the mid-seventies, mainly to refer to a biological ecosystem. In the last few years, however, “Indo-Pacific” has come to describe a set of interrelated maritime security challenges from the East China Sea to the Arabian Sea — particularly as India’s Navy makes forays into the South China Sea and China seeks to protect its supply routes through the Indian Ocean. But the geopolitics brought into focus by this “45 degree tilt” of the map is not restricted to India and China; it also includes the US, Australia, Japan, and the rising powers of Southeast Asia. As with the notion of “AfPak” that shaped the last decade, India is not the architect of this new cartography that displaces the notion of South Asia as a unified strategic space inherited from the British Raj, but India need not necessarily object to this new imagining. So who is shaping this relatively new conceptualization? The origins of this new focus apparently date back to a 2009 speech by Australian Foreign Minister Kevin Rudd at the Asia Foundation in San Francisco. (He may have been influenced in part by the recent writing of Robert Kaplan). 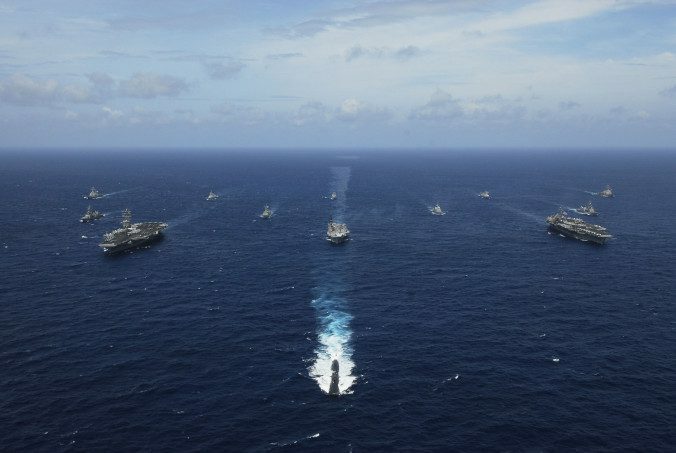 Rudd argued that in the future, the Indian Ocean would become as central to maritime security thinking and defense planning for powers like the US and Australia as the Pacific is currently. Essentially, Rudd advocated replacing the notion of the “Asia-Pacific” theater, which is partly a legacy of WWII and Cold War era strategic thinking, with the concept of “Indo-Pacific” as an integrated theater of operation to focus on emerging security challenges. The new conceptualization anticipates the rise of India as a major naval power — an idea which is sure to flatter New Delhi — and as another counterweight to China. A cartographic reorientation on this scale is not something which can be achieved by fiat. It will require regional powers to embrace and integrate this new framing of the map. Indian security elites, for example, have only recently begun to think strategically from an “upside down” map or an “ant hill” perspective of South Asia. The reflexive desire is to prioritize immediate and long-standing security challenges over emerging challenges. And these reflexes may not be ill placed for countries like India and China which have long unsettled borders and a history of conflict (as well as cooperation). Moreover, an overemphasis on the potential for conflict in the Indian Ocean and South China Sea ignores the ways in which Chinese infrastructural investment in Pakistan may help China to circumvent the long sea route for a portion of its imports and exports — although China will still have an interest in new sources of energy off its coast. There is also the risk of overplaying the growing strength of China while ignoring the ways in which it is also becoming more vulnerable. Even though India did not invent this new conceptual map, it need not view it in a hostile light. India’s maritime priority will always rest in Indian Ocean, but its ships will increasingly need to move freely outside the Indian Ocean to maintain India’s access to resources and markets. As such, India will benefit from a stable and uniform order that extends well beyond the Straits of Malacca. An Anglophone dominated order in the Indo-Pacific may be more comfortable for India given its regime type, distrust of China, and growing ties with the US and Australia. Expanding ties with other rising powers in the Indo-Pacific that share some of India’s concerns about China is also prudent since America cannot be relied upon to retain its attention in the region over the long term. 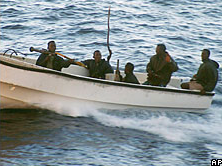 No sooner did I blog about the growing security threat posed by maritime piracy than several powerful militaries took notice… not because I was particularly persuasive, but because a Ukranian freighter loaded down with $30 million worth of tanks, grenade launchers and other military equipment was captured by marauders off the coast of Somalia. Two dozen crew members are still hostage aboard the MV Faina, now anchored off the Somali coast, while the pirates repeatedly isuse a series of ransom demands – though it’s not obvious to me to whom. (Also, their demands have fallen, like the global stock market, since Sunday: down to $20 mil from an original demand of $35 mil.) Both the US and Russia have sent vessels to intercept the MV Faina – Russia because many of her crew members are Russian; the US because of intel that the arms shipment may have been heading not to Kenya, as claimed by both Nairobi and Kiev, but rather to Khartoum. (The plot thickens.) Neither country wants the pirates to sell the weapons to Islamist warlords in Somalia, although it is quite unclear whether they would even be in any position to offload such heavy machinery. In an mildly entertaining twist on the story, a spokesperson for the pirate crew was interviewed today by the NY Times. The Somali pirates who hijacked a Ukrainian freighter loaded with tanks, artillery, grenade launchers and ammunition said in an interview on Tuesday that they had no idea the ship was carrying arms when they seized it on the high seas. “We just saw a big ship,” the pirates’ spokesman, Sugule Ali, said in a telephone interview. “So we stopped it.” In a 45-minute interview, Mr. Sugule spoke on everything from what the pirates wanted (“just money”) to why they were doing this (“to stop illegal fishing and dumping in our waters”) to what they had to eat on board (rice, meat, bread, spaghetti, “you know, normal human-being food”). Though Adam Blickstein reminds us we can hardly take his rhetoric at face value, it does show him to be a skilled and savvy diplomat more than a common criminal. He manages to make a principled claim justifying his behavior on nationalist grounds, while claiming to side-step any political motives that would link him or his crew to US or Russian security interests in the region. Not that the superpowers are buying it for a moment – though neither are they storming the ship. Yet.